If you were paying attention in high school, you might remember that Philly was the first capital of the United States. (Nope, it wasn’t Boston or New York City, though the latter did temporarily serve as the national seat of government when Washington D.C. was still a tepid swamp.) Perhaps you even recall prominent Philadelphians from the Revolutionary era, like Ben Franklin (the guy who flew his kite in a lightning storm) and Betsy Ross (the seamstress who sewed the first American flag – more about her later). Today, Philly is the sixth-largest city in the country – and though it’s overshadowed by nearby New York City, it feels even bigger. But despite that heft, it’s remarkably affordable: According to RentJungle, the average Philadelphia apartment rent is less than $1,650 per month, compared with more than $3,000 per month in New York City. Higher overall prices even make it hard to save money on groceries. Philadelphia is also a snap to reach. Virtually every major U.S. city, and plenty of smaller population centers, have nonstop or one-stop services to Philadelphia International Airport. 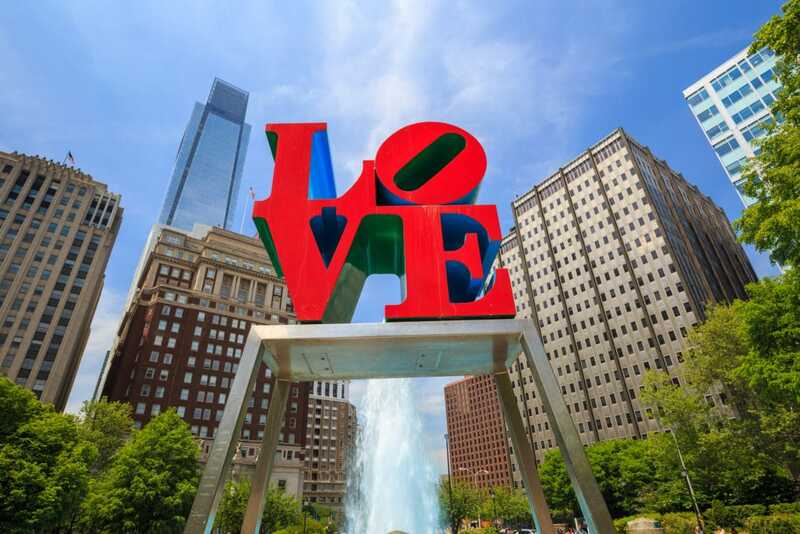 So, whether you’re a history buff curious about where the United States was born, a frugal cosmopolitan looking to explore a new city, or an adventurous road warrior planning a family driving vacation up or down the East Coast, Philadelphia is your kind of town. In this guide, I’ll show you how to make the most of your time in Philadelphia. For money-saving tips, check out our article on ways to save money on vacation. Before you begin your Philly trip, look into these time- and money-saving resources. Visit Philadelphia is “the official visitor site for Greater Philadelphia,” which includes the city of Philadelphia and the four populous Pennsylvania counties surrounding it to the north, west, and south. Its website is a tourism tour de force. On it, you can find exhaustive information about popular tourist attractions in and around Philadelphia, hotel and dining options, seasonal and one-off events, tailor-made itineraries, and much more. Most importantly for frugal travelers, the 1/2-price ticket deals page has dozens of deep admission discounts to “museums, theaters, shows, exhibitions, and more.” If saving money in Philadelphia is a priority for you – and why wouldn’t it be – then Visit Philadelphia should be your first stop. Philadelphia Convention & Visitors Bureau is “Philadelphia’s official global convention & visitors site.” Though its portfolio appears to overlap a bit with Visit Philadelphia’s, it’s clearly focused more on the city of Philadelphia itself. The discounts aren’t as plentiful or obvious here, but the interactive Philadelphia tourist map alone is worth a look. If you’re on a tight schedule, it’s the only resource you need to plan a walking visit to Philly’s historic Old City, where most of the Revolutionary-era attractions live. Unless you plan to avoid the Old City entirely, head to Independence Visitor Center once you arrive in Philadelphia. Here, you can find brochures from nearly every attraction, museum, historic site, and tour company in town – and a good many from well outside town as well. Look for attractions marked “Philly After 5” – since most museums and historic sites close at 5pm, it’s helpful to know what’s open for night owls. You can also purchase tickets to dozens of major museums and attractions at the main desk (some attractions’ tickets are available on the website too). This lets you skip the line and avoid waiting for entry at low-capacity museums and historic sites, so it’s worth your while to plan your itinerary in advance or talk to an on-site concierge. During the busy summer months, a 30-minute trip to Independence Visitor Center could save you untold hours of waiting on hot, angry lines. Philadelphia CityPASS is a super-popular multi-ticket pass that provides discounted access to your choice of three, four, or five of the following 12 major Philadelphia tourist vendors: The Franklin Institute, Big Bus Company and Philadelphia Trolley Works, One Liberty Observation Deck, The Philadelphia Zoo, Adventure Aquarium, Please Touch Museum, National Constitution Center, Museum of the American Revolution, Eastern State Penitentiary, Barnes Foundation, Academy of Natural Sciences of Drexel University. Cumulatively, adult admission to these attractions and vendors is well over $100. With CityPASS, total admission ranges from $49 to $76, depending on the number of attractions you choose. With the five-day pass, you can save up to 44% on sticker price. If you’re planning on spending a few days in Philly and you’d normally patronize at least three of these attractions, Philadelphia CityPASS is a no-brainer. Though similar to Philadelphia CityPASS, Philadelphia Pass (a service of Smart Destinations) is both costlier and more versatile. Note that prices (listed below) may vary seasonally, with higher rates during the warm season and lower rates in winter. All Inclusive: Includes all 34 eligible attractions over periods of one to five days. Pricing starts at $59 for the one-day pass and ranges up to $109 for the five-day pass. Longer-term passes are definitely a better deal – you’ll save up to 55% versus paying at the gate. Explorer: Includes access to three, four, five, or seven eligible attractions within 30 days of activation. Pricing starts at $49 for the three-choice pass and ranges up to $99 for the seven-choice pass. You’ll save up to 40% versus paying at the gate. Build Your Own: This 30-day pass accommodates as many or as few attractions as you like. You can save up to 20% versus paying at the gate. Free Tours by Foot is a national company that provides technically free tours in several historic cities, including Philadelphia. I say technically free because the experience is actually “name your own price” – at the end of each tour, participants pay the guide what they think the tour is worth. Depending on the length and quality, $10 to $25 per person is a reasonable range. Keep in mind that these tours require a fair bit of walking, as the name suggests. For history buffs, the Independence Mall tour is a must-see. For people who prefer an up-close-and-personal look at modern Philadelphia, the Real Philadelphia tour is a better bet. And, for daredevils, the Ghosts of Philly tour is where it’s at. I’ve done FTBFs in the past and have always been blown away by the guides’ knowledge and friendliness. For the cost, there’s no better way to learn about a new city from a real local. Washington D.C.’s National Mall isn’t America’s only iconic outdoor mall. Located in Philly’s Old City, Independence Mall is an oblong rectangle split into three mostly grassy blocks. It’s dotted and rimmed by some of the city’s most important and popular historic attractions. The National Constitution Center is the newest major feature on Independence Mall. Less than 15 years old, it was created to “disseminate information about the United States Constitution on a non-partisan basis in order to increase the awareness and understanding of the Constitution among the American people,” in the words of the U.S. Congress. The second-floor exhibits provide an exhaustive look at the United States’s foundational precepts of governance and are definitely worth the price of admission. If you’re on a tight budget, check out the free first-floor exhibit, which explores the various powers (and checks on those powers) of the U.S. President. The Liberty Bell Center is a completely free, if relatively compact, exhibition that showcases the most famous bell in America. In addition to the centerpiece, the oblong facility takes visitors on a narrative tour of the bell’s long history and numerous homes, plus relevant historical events (such as the Civil Rights movement) that occurred in concert. Independence Hall is where both the Declaration of Independence and the U.S. Constitution were signed. Lines can get very long here, especially during the high season, so do your best to arrive early. Note that admission is by tour only – you can’t just walk in. Fortunately, tours are quite large, run every 20 to 30 minutes, and are led by super-knowledgeable National Park Service employees. Congress Hall is nearly as famous as Independence Hall. Once a county courthouse, it served as the home base of the federal government’s legislative branch during Philadelphia’s decade-long reign as the national capital, between 1790 and 1800. The House of Representatives chamber is downstairs while the Senate is up a long flight of stairs on the second floor. From March through December, admission is by tour only due to high demand. Like old graves? You’ll love Christ Church Burial Ground. This two acre, nearly 300 year old expanse sits in the shadow of the United States Mint, just steps from Independence Hall. Five signers of the Declaration of Independence, including Benjamin Franklin himself, are buried here. So are about 1,400 other souls, including a number of names you’ll surely recognize. Curious about where those coins in your wallet come from? Take the U.S. Mint’s self-guided tour, a 45-minute immersion in all things metal currency. The sleek, spacious exhibits follow a logical path from raw metal to finished coin, and you can look down on the actual minting floor from most of the main hall. On the mezzanine, there’s a compact set of exhibits on rare and special coins, plus a look back at the Mint’s long and distinguished history. Alas, while the tour is free, you don’t get to take any souvenirs home with you. The Old City is – you guessed it – Philadelphia’s oldest and most historically significant district. It stretches from the Delaware River on the east to Independence Mall on the west, and from the Vine Street Expressway in the north to South Street in the south (though precise definitions vary). Many of Philadelphia’s top historical attractions are found here. A surprising number are free to enter and explore. Elfreth’s Alley, a National Historic Landmark since 1966, claims to be America’s oldest residential street. From its humble beginnings as a short-cut cart path near the Delaware River waterfront, Elfreth’s Alley has grown into a beloved urban gem with more than 30 immaculately preserved Colonial and Federal townhouses. Not surprisingly, it’s one of Philly’s most coveted addresses. There’s a small museum here with organized tours as well. Betsy Ross House was once home to the country’s most famous seamstress: the woman who sewed the first official American flag, commissioned shortly after the signing of the Declaration of Independence. Ross’s design set the tone for future versions of the American flag, so it’s no understatement to say her fingerprints are all over the world’s most recognizable national symbol. And it turns out that Ross was quite an entrepreneur besides – an impressive feat in pre-feminist America. This place exceeded my admittedly low expectations; the self-guided tour is worth 45 minutes of your time. Christ Church is a still-functioning Episcopal church that once served the cream of Philly’s faithful flock. It’s actually a few blocks from the eponymous burial ground, but easy enough to access on foot after you’ve ogled Ben Franklin’s grave. If you time your visit right, you may stumble upon one of the church’s free, semi-impromptu tours. One of the tallest buildings in the Old City, and certainly the most imposing, United States Custom House (or simply “Custom House”) is a federal office building built in the 1930s, during the heyday of the Art Deco movement. Most of the building is closed to the public, but if you’re walking by, definitely snap some exterior pictures. Built in 1682 and officially designated a National Historic Landmark in 2011, this iconic house of worship is one of the most recognizable remnants of Pennsylvania’s historic Quaker community. The leafy grounds of the Arch Street Meeting House provide a welcome respite from the bustle of the Old City, and the adjacent burial ground is a solemn reminder of just how many prominent Quakers made Philadelphia their home. Inside, there’s a neat set of exhibits that’s well worth the $2 admission fee. Congregation Mikveh Israel is the United States’s oldest continuously operating synagogue – dating all the way back to 1740. It still runs daily morning services, so be sure to check the website before dropping in. The staff is happy to give tours by appointment. Franklin Court is one of several Philadelphia historic attractions devoted to the city’s most famous Revolutionary-era resident. It’s an easy walk from Independence Hall. Don’t miss the vintage printing office (Franklin was, first and foremost, a prominent printer) and the ruins of the parcel’s original structures. Incongruously, there’s a working post office on the site too. Carpenters’ Hall is a multi-purpose building best known for hosting the first Continental Congress in 1774. (The Declaration of Independence wasn’t signed until two years later.) At various points, it also housed the American Philosophical Society, Franklin’s Library Company, and the First and Second Banks of the United States. Today, it’s a small but well-kept museum focusing on early American artifacts (including some cool furniture). Philadelphia has plenty of additional historic attractions and museums. Some are located in the Old City and adjacent neighborhoods. Others are farther afield. The Benjamin Franklin Museum is one of the newest attractions in historic Philadelphia – it opened in 2013, some 220 years after Franklin’s death. Located in Franklin Court, it’s a family-friendly homage to America’s original Renaissance man. Don’t miss the eerie Ghost House behind the main structure: a steel skeleton that traces the outlines of Franklin’s original print shop and private home. Prominently located on Independence Mall, the National Museum of American Jewish History occupies an imposing glass building with stunning views of the Center City skyline. It’s dedicated to the story of Jewish migration to the United States, starting back in Colonial times. At various times uplifting, mesmerizing, poignant, and tragic, it’s the best place in the country to learn about an often-overlooked and quintessentially American story of immigration and assimilation. With towering marble columns and a classic white facade, the First Bank of the United States looks the part. Set right up on the sidewalk and flanked by ample but insignificant-seeming trees, it completely overwhelms its surroundings. In fact, I couldn’t back up far enough to get a good full-on photo of the front. If you can do better, let me know. Fun fact: the First Bank is believed to be the oldest surviving U.S. structure with a classical facade. The Second Bank of the United States was chartered about a generation after the first, as the federal government creaked under the weight of debts incurred during and after the War of 1812. Visually, it’s comparable to the First Bank. Inside, there’s an added bonus: a portrait gallery with paintings of prominent members of Philadelphia’s Revolutionary generation. The National Liberty Museum is “dedicated to preserving America’s heritage of freedom by encouraging people to find their own place in the story of liberty.” That’s achieved through a combination of slick exhibits highlighting heroic stories of sacrifice and bravery, and a surprisingly edgy collection of contemporary glass art. Somehow, it works. The National Liberty Museum is appropriate for all ages, but kids are especially at home here. The oddly named Chemical Heritage Foundation Museum is “dedicated to explaining a simple truth: science has a past and our future depends on it.” The Foundation has a slew of resources for scientists and academics, including an impressive reference library, but the public-facing museum is basically a miniature pop-science museum with a heavy focus on chemistry. Exhibits cover a range of fun topics, including old medicinal compounds, the science behind high-tech fabrics, and chemistry in space. If you’re traveling with a science buff, you’ll have a hard time prying him or her away. Like any major city, Philadelphia has plenty of cultural attractions and museums that don’t directly relate to early American history. Some are pricier than others, but discounts and deals (including from the vendors and resources mentioned at the top of this guide) aren’t too hard to find. Not to be confused with the Benjamin Franklin Museum, the Franklin Institute is a modern, world-class science museum that’s appropriate for all ages. Though there’s an onsite memorial to Franklin, an accomplished scientist, the main attractions are the permanent and temporary exhibits covering everything from the age of the dinosaurs and the human brain to robotic automation and virtual/augmented reality. On cloudless nights, the observatory is hands-down the best place to stargaze in central Philly (though light pollution is obviously a problem). Even if you’ve never visited Philadelphia, you’ll probably get deja vu as you gaze up the broad stone steps at the east entrance to the Philadelphia Museum of Art, a stunning Neoclassical structure near the Schuylkill River. That’s because they’re arguably the most famous art museum steps in the world, thanks to Sylvester Stallone’s star turn in the first “Rocky” film. The best part: you can climb them yourself without paying admission. Of course, there’s plenty more to see inside. This is a world-class art museum with thousands of items in its permanent collection and an ever-impressive set of rotating exhibits, such as “Lino Tagliapietra: Painting in Glass” and “Threads of Tradition,” a look at West African textile art. If the price of admission seems steep, remember that it gets you into the museum’s two buildings, plus the Rodin Museum, for two consecutive days. New Hall Military Museum is a small Federal-style house in Carpenter’s Court, near the First Bank of the United States. The compact exhibits, most of which house military artifacts and memorabilia from throughout the U.S. military’s history, are easy to breeze through in a few minutes – though military buffs are likely to linger. If you visit before June 2017, call ahead, as the building is undergoing substantial renovations. Philadelphia’s Magic Gardens isn’t really a garden. It’s a bizarre, indoor-outdoor museum consisting entirely of repurposed glass and metal sculpture: bottles, mirrors, wire, rebar, and other rough materials refashioned into arresting, avant garde shapes. If you’re not sure about paying the $10 admission fee, you can see some of the outdoor portion from South Street. Also, consider buying your tickets in advance, as lines can get long on nice days (especially on weekends). Located in the heart of Center City, Reading Terminal Market is foodie heaven – at least, for the breakfast and lunch crowd. The focus here is on affordable, unpretentious street food representing dozens of global cultures, from Latin America, to Asia, to Pennsylvania (Dutch). You can also find souvenir mugs, tableware, raw ingredients for pretty much anything that lives in a kitchen. To avoid peak crowds in Reading Terminal Market’s narrow aisles, consider visiting outside the lunch hour. Completed around the turn of the 20th century, Philadelphia City Hall is the largest municipal building in the United States – somehow, larger than its counterparts in bigger cities like New York, Los Angeles, and Chicago. It feels like all roads lead to City Hall, and in a sense that’s true: the building sits atop a vast plaza encircled by a huge traffic circle (technically a square) formed by the intersection of Philly’s three grandest thoroughfares. If you’re exploring Philly on foot, there’s a good chance you’ll pass through here anyway. And, if you find yourself on Broad or Market Streets, you’ll probably catch a glimpse of the iconic William Penn statue atop the hall – until 1987, the highest man-made point in Philadelphia. For a more in-depth experience, spring for a ticketed tour, which includes a whisk to the top-floor observation deck. The sheer density of Barnes Foundation’s collection makes it nearly impossible to absorb everything in one visit, and the lack of descriptive placards (beyond laconic printed guides in each room) is overwhelming for art novices. But, whatever you get out of the experience, it’s bound to be the highlight of your day. If you have time, head out to the suburb of Lower Merion and check out the Barnes estate, which has an excellent arboretum on site. Located a short walk down Benjamin Franklin Parkway, the Rodin Museum is a sculpture-centric institution operated by the Philadelphia Museum of Art. It’s a great complement to its parent institution, and with reasonably priced combined admission, there’s little downside to spending at least a few minutes wandering its halls. When the weather is nice, don’t miss the stunning, immaculately landscaped outdoor garden space – a rarity in central Philadelphia. Perched high atop One Liberty Plaza, one of Philly’s tallest office buildings, One Liberty Observation Deck is literally the best public view in town. If you’re not sold on the $14 admission fee, consider diversifying your investment with Philadelphia CityPASS, which can be made to include One Liberty Observation Deck. If you opt for the two-admission deal, definitely do at least one of your visits at night – the twinkling skyline is out of this world. Despite its age and density, Philadelphia has a surprising amount of green space, especially along the Schuyllkill River. If you’re looking for a break from the clang and clatter of the city, escape to one of these magnificent parcels. Unless otherwise noted, the parks and natural areas listed here are free to enter and explore. Located just a few short blocks from Independence Hall, Washington Square is one of Philadelphia’s five original parks. The surprisingly spacious square, now nearly surrounded by tall buildings, is a contemplative oasis that includes a monument (the Tomb of the Unknown Soldier of the American Revolution) and a clone of one of the most famous trees in the United States (a sycamore that literally traveled to the moon and back on an Apollo mission). Another original park, Franklin Square is decidedly less staid than Washington Square. It’s home to central Philadelphia’s only mini golf course ($9 per adult, $7 per child under 12), a restaurant, a playground, and a carousel. This is a great place to blow off some steam with the kids, though be warned that it gets very busy during the summer. Yet another original Philly square, Rittenhouse Square is arguably the liveliest and most popular of them all. It anchors one of the city’s finest neighborhoods – one of the few to successfully resist the economic decay and disinvestment of the 20th century. Hit Ritt Square after visiting City Hall and people-watch from one of the many benches. If you visit in the spring, the Rittenhouse Row Spring Festival – a music and food extravaganza – is not to be missed. Logan Circle is the centerpiece of the Logan Square neighborhood, which stretches north and west from City Hall. Confusingly, Logan Circle is sometimes called Logan Square, even though it’s very clearly circular. The main attraction here is a grand fountain surrounded by landscaping, paths, and benches. Bear in mind that Logan Circle is essentially a huge traffic circle, so it’s not especially accessible by foot. Benjamin Franklin Parkway cuts diagonally through the Logan Square neighborhood, connecting City Hall with the Philadelphia Museum of Art. Grand buildings, including more than a half-dozen museums and a slew of luxurious high-rises, line the roadway at generous setbacks. Closer to the pavement, broad, landscaped lawns with ample tree cover prevail. I spent about an hour strolling Ben Franklin Parkway on an unusually warm winter day, and despite the lack of leaf cover, I felt like I was far, far away from central Philadelphia. Philadelphia Zoo houses more than 1,300 animals in 42 ample acres. It bills itself as “America’s first zoo,” and though it’s dwarfed by world-class institutions like the San Diego Zoo, it retains an inimitable charm. Zoo360, a recent addition, makes it possible for larger animals to roam freely throughout the zoo in a system of secure catwalks and passageways that allow visitors to (safely) get up close and personal. Located in Northwest Philadelphia, along a lively tributary of the Schuylkill River, Wissahickon Valley Park is a 2,400 acre expanse comprising what was once one of the most heavily industrialized watersheds in the United States. Though traces of that past remain today, most of the park is given over to lush forest and marshland. Miles of trails wind through the trees. If you’re looking for a truly wild escape from the hustle and bustle of Philadelphia without even venturing outside the city limits, Wissahickon Valley is one of two options. The other is Fairmount Park, a vast wooded tract (actually multiple tracts) spanning about 9,000 acres along the Schuylkill River and its tributary streams. It’s within sighting distance of Philadelphia’s City Hall, surrounds the Philadelphia Museum of Art, and extends for miles along the heavily forested river. You could spend days in Fairmount Park and still not see everything the place has to offer. Most visitors spend an hour or two hiking or picnicking along the river and move on. Note that the park is technically open from sunrise to sunset, though entrance is not strictly controlled. Philadelphia has dozens of distinct neighborhoods. Even if you stick exclusively to touristy areas, you’ll pass through several. If you’re willing to get off the beaten path, the city is truly your oyster. Here’s a look at some of the most interesting and accessible parts of Philly. Antique Row is a friendly neighborhood on the edge of Philly’s historic district. Numerous 18th- and 19th-century brick row houses dominate the streetscape, interspersed with a few Colonial-style structures. It’s very picturesque. I stayed at a surprisingly affordable Airbnb in the area and found dozens of restaurants – along with two full-service grocery stores – within easy walking distance. Just east of Antique Row, Society Hill is an even better-preserved neighborhood that once housed Philadelphia’s elite. (And, by the looks of it, still does.) Every other rowhouse seems to be landmarked, and many windows bear placards warning of impending threats to Society Hill’s character. If you find yourself in the Old City, definitely set aside 30 minutes or so to explore this part of town. And, if you’re up for a splurge, check out Dock Street, home to some of Philly’s most innovative fine-dining restaurants. Rittenhouse Square the neighborhood surrounds Rittenhouse Square the park. Got that? Like the rest of Center City, Rittenhouse Square has more than its share of historic buildings, though there are plenty of newer high-rises and office blocks. Aside from the green space, the main attractions here are the fine restaurants on 18th Street, the dramatic public art, the annual Christmas tree lighting ceremony, and the impressive lineup of locally owned businesses on the commercial streets radiating outward from the park. Tucked away in South Philadelphia, East Passyunk is a formerly downtrodden working-class neighborhood that’s reinvented itself as the city’s top destination for frugal foodies. Two of the best places for cheesesteaks, Philly’s iconic street food, are found here: Geno’s Steaks and Pat’s King of Steaks. Even better, they’re right across the street from one another. Home to Drexel University and the University of Pennsylvania (a private Ivy League school, not to be confused with Penn State), University City has a high student population and a correspondingly lively nightlife scene. Located in West Philadelphia, across the Schuylkill from Center City, it’s well-served by transit and has a surprising diversity of affordable lodging options. Once the hub of Philadelphia’s fishing industry, Fishtown is now the leading edge of its hipster community. If you’re a fan of offbeat, independently owned shops and affordable, innovative eats, you’ll love this part of town. Though it’s cut off from Center City by the Vine Street Expressway and some disused industrial real estate, Fishtown has excellent transit connections to downtown, so it’s a good place to look for affordable Airbnb-type lodging. Just southwest of Fishtown is Northern Liberties, whose rebirth as a haven for creatives and young professions is a bit further along than its northeastern neighbor. If you’re planning a night on the town, but want to avoid University City crowds and Center City pricetags, Northern Liberties is a strong alternative. With a growing base of farm-to-table restaurants, it’s also a solid choice for the morning after. Philadelphia doesn’t exist in a vacuum. It’s just under 100 miles from New York City and just over 100 miles from Baltimore – though you don’t have to go to either metropolis to see something different. These local destinations are all within easy reach of Philly by car or train (or both). If you’re planning a longer trip to the region, make time to see one or two. One of the country’s oldest enclosed shopping malls, King of Prussia Mall is now officially the largest by leasable square footage, following an ambitious expansion that wrapped up in 2016. (Other malls, such as the Mall of America near Minneapolis, are bigger by other metrics.) You don’t have to spend money to appreciate this gargantuan ode to consumer culture – a walk through its cavernous environs will suffice. Located about an hour west of Philadelphia, Lancaster is the urban hub of Pennsylvania’s famous Dutch Country. Many visitors come here to ogle at the Amish minority, whose horse-drawn carriages and signature barns dot the surrounding countryside. If you visit in late winter or early spring and have ample luggage space to carry auction finds back with you, check out the region’s famous “mud sales,” which raise money for local fire departments. For family-friendly foodie fun, visit Kitchen Kettle Village and Lapp Valley Farm, whose ice cream is out of this world. With a climate reminiscent of the British Isles, the countryside of southeastern Pennsylvania is prime territory for English-style formal gardens. Whether you’re a die-hard botany buff or simply have a soft spot for genteel estates, you won’t regret taking a half (or full) day to step back to a simpler, lusher time. Longwood Gardens, a nearly 1,100 acre private arboretum near Kennett Square, is the region’s crown jewel. Admission is $23 per adult ($30 per adult during the winter holidays). Chanticleer Garden, near Wayne, is smaller and cheaper ($10 per adult). I could write an entire guide about the Jersey Shore – or produce a TV show, if someone else hadn’t thought of it first. Despite its questionable cultural connotations, the Jersey Shore is a big place with many distinct enclaves. The communities and sub-regions closest to Philadelphia include the ramshackle gaming mecca of Atlantic City, the more or less family friendly boardwalk town of Ocean City, the boisterous Wildwoods area, and the staid (by Jersey standards), picturesque Cape May. If you only have a day or two, do some research and settle on a single Shore destination that best fits your tastes. The region swells with visitors during the summer months, so plan high-season visits accordingly. Conversely, many local businesses close or restrict hours during the low season. Though its climate is technically subtropical, Philadelphia has four distinct seasons. Spring and fall are the most pleasant. The occasional cold snap or heat wave aside, high temperatures range from the 50s to the 70s, and breezy sunshine is abundant. Summers are hot and humid. Average highs exceed 80 degrees, and readings above 90 degrees aren’t uncommon. Stickiness is the norm. If you’re renting an older apartment or townhouse in central Philadelphia during the summer months, make sure it has air conditioning before you arrive. Expect an afternoon thunderstorm or two. Winters are cold and wet. Extended periods of bitter cold are rare, but snow and ice aren’t uncommon. The typical year is good for a major snowstorm or two, though mild winters can be virtually snowless and severe winters can be truly relentless. In older homes, winter’s damp chill is exacerbated by leaky windows and aging heating systems. Philadelphia isn’t in an earthquake zone, though minor tremors have occurred here in the past. However, it’s close enough to the Atlantic Ocean to be somewhat vulnerable to tropical storms. In October 2012, Hurricane Sandy brushed the Philadelphia area before wreaking havoc on parts of New Jersey, New York City, and Long Island. This is worth keeping in mind if you plan to visit at the height of Atlantic hurricane season – July through October. Despite the sometimes oppressive conditions, summer is Philadelphia’s tourist high season. Winter tends to be slower. If you plan to see lots of historic sites and don’t mind the cold, visit between December and March (winter holidays excepted), as you’re apt to find much shorter entry lines and shorter waits for tours. When I visited in early February, I felt like I had the run of the Old City, despite a couple slight inconveniences due to truncated hours at key attractions. I was able to find some great lodging deals as well. Once the weather gets warm, crowds return. Philly is an insanely popular destination for summer camps and school field trips, so you won’t necessarily avoid crowds on weekdays. If you do want or need to visit during the summer months, consider August, when locals flee to the Poconos or Jersey Shore. Weather-Appropriate Clothing. If you visit during the hot season, bring more breathable cotton clothing than you think you need. During the spring and fall, easily sheddable layers – including a light jacket, fleece or cardigan, and cotton underlayers – are ideal. In winter, bring a sturdy jacket or coat, winter hat, gloves, scarf, and warm socks. Rain Gear. Rain is common in Philadelphia throughout the year – there’s no real dry season here. No matter when you visit, bring an umbrella, water-resistant footwear, and potentially a rain coat, unless your regular jacket or winter coat is waterproof. A waterproof or water-resistant bag is a good idea as well. Comfortable, Sturdy Footwear. Central Philadelphia is best explored on foot. During my brief trip to Philly, I covered three or four miles per day without really trying, and was very glad I brought sturdy running shoes. You’d do well to do the same. If at all possible, avoid heels, as many streets and sidewalks are cobbled or just generally uneven. Hydration Gear. All that walking is sure to make you thirsty. Even if it’s not particularly hot, bring a refillable water bottle or hydration pack (such as a Camelbak) when you hit the sights. Backpack or Satchel: Don’t forget a sturdy backpack or shoulder satchel to carry your tourist kit: maps, water, extra clothing, camera, wallet, sunglasses, and whatever else. You won’t have to worry about overstuffing your pockets or occupying your hands, nor will you have to run back to your hotel or apartment every time you need something. With a dense cityscape, reasonably safe streets for recreational cyclists and bike commuters, and a very good public transportation system, Philadelphia is a great place to live without a car. By the same token, it’s a pretty stressful and expensive place to drive. Philly visitors from outside the Northeast and Mid-Atlantic regions typically arrive at Philadelphia International Airport (PHL), a major air hub located a few miles south of Center City. PHL is a 30- to 60-minute train ride from central Philadelphia. Visitors from the Northeast and Mid-Atlantic are more likely to drive or take the train to Philadelphia. The city has three major train stations: 30th Street (the largest), Suburban, and Jefferson. Amtrak and New Jersey Transit trains arrive through 30th Street Station, which has a slew of urban and suburban transit connections (including commuter rail, subway, trolley, and bus). Suburban and Jefferson stations are mainly for local transit. All three stations are within walking or biking distance of most central Philly attractions. Despite Philadelphia’s dense cityscape, long commute times, and ugly traffic congestion, driving is sometimes the best option for visitors. Here’s what you need to know about operating (and ditching) passenger vehicles in Philly. In Philadelphia proper, most historic and cultural attractions are within easy reach of public transit or rideshare. In Center City and densely populated parts of south Philadelphia, a car is likely to actively hinder your experience and needlessly increase your out-of-pocket costs. The calculus changes if you’re staying in the suburbs, transit-poor urban neighborhoods in north Philadelphia, or with a friend lucky enough to have access to off-street parking. Likewise, if you’re planning to take multiple trips beyond Philadelphia’s borders, a private car is likely the cheapest and most convenient transportation option. If you’re driving into Philadelphia, it’s pretty easy to temporarily mothball your car. The most popular place to do so is the economy lot at Philadelphia International Airport, which costs $11 per day (taxes and fees included). From there, you can catch a shuttle to the terminal buildings, then transfer to a train heading to Center City ($3.75 to $6 one way, depending on date and purchase method). PHL is south of central Philly, so it’s not particularly convenient for drivers heading in from the north. Fortunately, you can leave your car overnight at most SEPTA stations for a nominal daily cost of $1 to $2. Compared with the airport, parking is not as plentiful at most regional rail stations, especially on weekdays. Also, depending on the line, inbound train service can be spotty in the evenings and on weekends, so you may have to wait a while once you park. Don’t forget to lock your car and remove or hide valuables. Most rental car companies operate out of Philadelphia International Airport. Choose carefully: some budget companies are located far from the terminals, with intermittent or nonexistent shuttle service. It’s better to pay a few extra bucks per day than to miss your flight because you couldn’t get a ride from the drop-off site to the airport. Car rental rates at PHL vary widely by car type. Around $20 to $40 per day is a typical starting price for compact and subcompact models. Before you buy, look for deep discounts on aggregators like Kayak and flash deal sites like Hotwire – on a recent trip to the Philly area, I got a compact car for less than $15 per day from a well-known company. Street parking is free in most outlying residential neighborhoods of Philadelphia. However, it’s very often permitted, meaning only neighborhood residents can park on-street for long periods. Outsiders are limited to two-hour stints. For all practical purposes, this forecloses overnight street parking in most of Philly. The Philadelphia Parking Authority (PPA) has reams of general information about local street parking policies. In central districts such as Center City and University City, street parking is metered. The most heavily trafficked areas have computerized meters that accept credit cards, but outlying neighborhood business districts still rely on coin-operated, space-specific meters, so stock up on quarters if you plan to drive in those areas. Street parking rates range from less than $1 per hour in outlying neighborhoods to $2.50 or more per hour in Center City. Check Visit Philadephia’s parking deals page for longer-term discounts that can significantly cut the cost of parking in busy areas. In busier areas, neighborhood parking garages are a viable alternative. Many grocery stores have small pay garages attached. While some spaces are reserved for customers, the rest are there for the general public’s taking. During my most recent visit, I found a secure garage for $20 per day on the outskirts of Center City – steep compared with the airport’s economy lot, but much cheaper and safer than parking on adjacent streets. Plus, garage parking is a great way to avoid the PPA’s steep parking fines. According to the PPA’s violations table, fines for common violations range from $26 for expired and overtime meters to $41 for parking in a prohibited zone. Philadelphia has a comprehensive, somewhat confusing public transportation system that definitely shows its age. However, if you’re staying in central Philly or a commuter suburb served by a bus or rail line, you’ll have ample opportunity to test it. Here’s an overview of the Philly area’s various transit agencies and their costs, coverage, and quirks. SEPTA is the main transportation agency in the Philadelphia area. It serves Philadelphia proper and the four surrounding counties on the Pennsylvania side: Bucks, Montgomery, Chester, and Delaware. Commuter Rail: Philadelphia’s Pennsylvania suburbs have nearly 300 commuter rail stations spread across SEPTA’s 13 lines. The commuter rail system is split into four zones: Center City/Zone 1, Zone 2, Zone 3, and Zone 4. Advance-purchased (online or at station ticket offices) fares cost $4.75 in Zones 1 and 2, $5.75 in Zone 3, and $6.50 in Zone 4 (assuming travel to and from Center City). Fares purchased from train conductors cost $1.25 to $1.50 more, regardless of fare zone. Weekend tickets cost $1 to $1.50 less, also regardless of fare zone. Bulk-bought tickets (packs of 10) are discounted anywhere from 5% to 20%. If you plan to use commuter rail extensively while in Philly, this is a budget-saver. Bus, Subway, Trolley: The standard one-way cash fare for bus, subway (including the Norristown High Speed Line), and trolley vehicles is $2.25. Tokens, which represent single one-way fares, can be purchased for $1.80 each in packs of two, five, or 10. Transfers cost $1 each and must be purchased prior to the start of the ride. One day Convenience Passes, good for eight rides on all buses, subways, and trolleys for one day only, cost $8 apiece. One day Independence Passes, which cost $12, include unlimited service on buses, subways, trolleys, and commuter rail. Weekly and monthly TransPasses, which entitle bearers to unlimited service on all buses, subways, and trolleys, cost $24 per week or $91 per month. See the SEPTA Fare Zone map for more detail about SEPTA’s bus, train, and trolley fares, zones, destinations, and other important information. New Jersey Transit (NJ Transit or simply NJT) connects Philadelphia with various towns and destinations in southern New Jersey. For a complete list of modes and destinations, check NJ Transit’s South Jersey – Philly page. Fares vary by mode, distance, and destination. For instance, a one-seat rail ticket from 30th Street Station (Philadelphia) to Atlantic City Rail Terminal (Atlantic City, New Jersey) – one of NJT’s most popular Philadelphia routes – costs $10.75 one way. If you plan to travel between Philadelphia and New Jersey on NJT vehicles, use NJT’s Advanced Trip Planner for itinerary ideas, route-specific schedules, and estimated fares. Operated by the Port Authority Transit Corporation, a subsidiary of the Delaware River Port Authority, PATCO Speedline is a rapid rail transit line that runs from Center City to Lindenwold, New Jersey, in about 30 minutes. From Linenwold, riders can switch to NJ Transit’s Atlantic City line, making PATCO a useful option for visitors who want to get to the Jersey Shore without a car. End-to-end fares are $3 one way and $6 round trip. It’s essential to learn about ridesharin services. Here are your best options. Uber and Lyft are ubiquitous in Philadelphia. Local ordinances require ridesharing vehicles to be clearly marked, and it’s particularly easy to spot Lyft’s telltale pink mustaches. I didn’t use either service extensively in Philly, as I was able to walk most places, but any time I pulled up the apps on my phone, my screen was covered with available rides. Philadelphia ridesharing costs vary by time of day, demand, ride distance, and ride time. During periods of regular demand, standard Lyft rides carry a $1.25 base fare, $1.45 service fee, $1.10 per mile fee, and $0.18 per mile fee, or a $4.50 minimum ride fee. There’s a $5 cancel fee for on-demand rides and a $10 cancel fee for scheduled rides. Budget-friendly UberX rates are comparable. Lyft Line and UberPOOL, both of which are essentially fixed-rate carpooling services that may or may not require you to ride with others, typically cost half to three-quarters as much as an otherwise identical Lyft or UberX ride. Central Philadelphia has a lot of Zipcar hubs – in fact, the parking garage within eyeshot of my rental apartment was a conspicuously marked hub. Depending on your chosen plan, Zipcar costs $6 to $9 per hour or $65 to $73 per day. You do need to pay an annual or monthly membership fee. That fee ranges from $35 per year for occasional drivers, who pay more by the hour and day, to $50 per month for heavy drivers, who get hourly and daily discounts. If you don’t use Zipcar in your hometown, it’s probably not worthwhile to sign up before your Philly trip, as the $25 application fee and nonrefundable annual or monthly fee would offset the convenience of having a car on demand. That said, if you’re already a paying Zipcar customer, it’s almost assuredly cheaper than renting a car for the duration of your Philly trip – unless you plan to do a ton of driving. For an older city with narrow streets, Philadelphia is surprisingly bike-friendly. If you’re serious about getting around the city on two wheels, start by downloading Philadelphia Bike Coalition’s PDF bike map. Keep in mind that lanes and trails are being added and altered all the time, so it’s best to check for updates with the Bike Coalition before your arrival. Unless you’re bringing your own bike into Philly, your best bet for point-to-point bike transportation is Indego, the city’s relatively new bike sharing program. For heavy users, the most cost-effective plan is the Indego30 monthly pass: you pay a $15 monthly fee and then bike for free, as long as you spend no more than one hour on any given bike (for longer trips, you can plan routes that take you to multiple Indego stations and swap out your bike at least once per hour). Walk-up rides cost $4 per half hour, or $10 per year and $4 per hour with the Indego Flex plan. Depending on where your travels take you, Wheel Fun Rentals – a national recreational rental chain – could be a cost-effective alternative to Indego. It’s possible to rent sturdy, off-road-capable bikes with helmets and locks for less than $35 per day at the Fairmount Park (Boathouse Row) location. Philadelphia is part of the Boston-Washington megalopolis, the United States’s most densely populated region. As the crow flies, it’s less than 100 miles from New York City (so close that it’s sometimes pejoratively referred to as the “sixth borough”). And it’s not much farther from Baltimore or Washington D.C. either. Amtrak train service between the Northeast corridor’s major cities, and the dozens of smaller population centers in the region, is fast, frequent, and relatively affordable. The Chinatown buses don’t serve as many destinations, and they’re not nearly as comfortable, but they’re an absolute steal. If you have more than a day or two to spare on your Philly trip, I’d strongly recommend getting out of town and seeing what else the East Coast has to offer. It’ll probably be cheaper than you think. Have you ever been to Philadelphia? Any other tips you’d reccomend?